I fumble around for a light switch as I walk softly in my skull printed Vans into the dark, cool reception room of a VFW Lodge. I find one, and suddenly spots of light float about the still dark room. Was this place alive once? It must have been, as old pictures of numerous past commanders run along the walls. These men were once young, and grow older in visual records as time races forward. Fewer new faces come, and most of the old ones are gone now, giving the wispy ghost-like darkness a haunted feeling. I trail down the wall to the 1940s, my favorite era in time. Young men, and many just home from the war, but I want to slide back just a bit further than these old photographs. I want to visit the time when these men were off fighting in foreign countries, and their wives, girlfriends, mothers, grandmothers, sisters and neighbors were taking responsibility for daily living. They did all this, all the while worrying about how they were going to make it, and how and if their loved ones would return home. Between newly acquired production line jobs and food rationing, women had to simplify their baking. Everyone was united in this war effort, either begrudgingly or wholeheartedly, but united nonetheless. 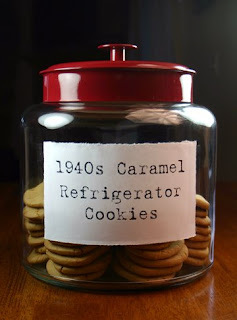 During this time, “Betty Crocker” printed a recipe for Caramel Refrigerator Cookies, which soon became an American favorite. 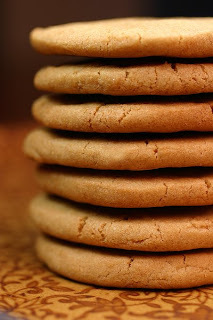 These cookies were easy enough, stored quite well in the refrigerator until you needed them, and used brown sugar instead of precious rationed granulated sugar. They were also straightforward and not too sweet. Just the way I like my cookies. I am in awe of the women who made it through this difficult time. They truly lived, good and bad, for better and worse. And after, they coped, celebrated, and had children. They moved forward, promoted service and veterans organizations, and changed the world. What an amazing time to be alive. Mix shortening, sugar, egg, and vanilla thoroughly. Measure flour by dipping method or by sifting. Stir flour, soda, and salt together; stir in. Form in roll 2 ½” across. Wrap in wax paper. Chill until firm. Heat oven to 400° (mod. hot). Cut in 1/8th” slices. Place slices a little apart on ungreased baking sheet. Bake 8 to 10 min., or until lightly browned. Makes about 5 dozen cookies. 1. 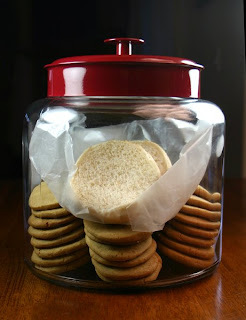 Lay a piece of wax paper on top of the cookies and place a piece of bread on the paper. This will keep the cookies fresh longer. 2. I doubled the recipe, and used half shortening and half unsalted butter. 3. I changed the vanilla to 1 Tablespoon for the double batch. 4. I froze the cookie logs for easier slicing. 5. I baked the cookies on parchment paper lined cookie sheets. 6. Soda in this recipe means baking soda. Recipe in its original form from “Betty Crocker’s Cooky Book”. Write-up and pictures by Laura Flowers. Great blog! Loved the "little" history lesson. I have been looking at some books about this era but I promised myself no more books until I finish the ones that I have. I have heard of this recipe and happy to come across it via you!! I love the cookie jar. Where did you get that? Have a great day. I got them at my local kitchen store, but they should be easy to find online. They're Montana Jars made by Anchor Hocking. What a wonderful post. It's amazing what these women were able to do with so many ingredients rationed or unavailable. This is another of their eggless wonders. Happy Mother's Day, Laura. I hope your "lighting man" has big hugs for you today. What a beautiful looking cookies! which is about applying savings and budgeting tips learned in the War, Victory Gardens, for example to today's precarious times. Keep up the good work! Thank-you, I appreciate that a lot. Precious...the cookies, the jar & the write-up. WOW. I got here via Ginger, & am glad I did! Bow to you; your photographs are fab. I have a lot to learn! I believe some of the gratest inventions, culianry and otherwise, have been born during times of hardship, I guess humans inherently are more creative under pressure! These cookies look great, I love your photos too. You really gave them an austere look! Refrigerator cookies are great. I haven't seen one for a caramel version before and will have to give these a try. These sound delicious and the pictures look great! These must be yummy if they have caramel included in the title. I love that you included additional photos! Great bread tip too - moisture transfer can definitely be a good thing. ENJOYED THE LESSON IN HISTORY AND I AGREE WITH YOUR APPRECIATION OF THE WOMEN OF THAT TIME. BRAVE , STRONG LADIES TO BE SURE! I posted my Grandmothers refrigerator cookies a while back. They are still my absolute favorite from my childhood. :) I couldn't agree more with freezing the cookie logs for easier slicing. Makes the whole job much easier. I stopped by to tell you that you've won the sample box over at Funky Chunks. Just e-mail me and give me you address so that we can send you Chunks to you! :) Congrats! These look fantastic. What a cool recipe! Love it! I shared your post for my mother who was a teenager in WW2 not knowing at the time she would marry a WW2 vet. It opened up so many stories about her experience during that time. She told me some of the coolest stories I ever heard. Thanks for opening that up for us! I don't know if they would of ever come up without your post. My father past away in an accident 18 years ago but, when she told me her memories of him it was like he was here. She told me it was her favorite mothers day ever. Thanks!!! Jenny I am so grateful you came back and told me. I have tears in my eyes right now. I linked your blog in my post. Thanks for sharing this recipe. I just made these cooking this morning. They are so easy and they taste great. This for sure will be a recipe that I use over and over again. Jaclyn thank-you for making these and for letting me know. I'm glad you liked this old recipe. They aren't too fancy, but still a special cookie. Stupid Rolo Turtles, Now I Need Bigger Pants.